I will never forget the moment I got my first piece of copper cookware. Until then, I’d functioned relatively well with a mismatch of hand-me-down pots and pans I’d collected throughout early adulthood. As an entirely self-taught foodie with a brewing passion for cooking, my first “grown up” pan was a gift from above. I remember thinking in the seconds after I opened it on Christmas morning that it was too pretty to actually cook with. But it was also too expensive not to use it for all the goodness it had to offer. That’s the thing about copper cookware – you get what you pay for. In my case, my starter copper saute pan remains one of my most prized possessions. True to its copper upbringing, it cooks almost anything evenly because of how well the properties in the pan react to changes in temperature. Yet I had no idea at the time how that investment compared in the greater scheme of all things copper cookware. It is a drop in the bucket. To start with, it’s not actually considered copper cookware. It has a heavy copper bottom, but is otherwise made up of stainless steel, as are most of my beloved cooking vessels. Not only that, but a pan is downright cheap in the realm of copper cookware. Before we delve deeper into the features and functions of the above-mentioned products, let’s learn more about this type of cookware. The scientific properties in copper make it one of the most highly sensitive elements to heat conduction. The result is a vessel that prevents the development of heat spots while cooking. It eliminates the fluctuations in temperature found in its stainless steel or Teflon comrades. To maximize the effect of even cooking, the best copper cookware is also the thickest in material. While it can be challenging to convince some cookware companies to release the exact weight and thickness of the copper, it is worthwhile to try to find products that are at least 2 mm or thicker. Many copper pans come in either smooth or hammered varieties. This used to matter a lot more in the past when a hammered appearance is always associated with good craftsmanship. In more recent years though, it’s more of a matter of personal preference as far as the appearance goes, since hammered and smooth cookware are both produced by machines. There are advantages and disadvantages to any of the three variations of materials used in copper cookware. Most copper cookware is available in bare, tinned and stainless-steel lined varieties and each has something unique to consider. Bare copper products are generally considered the least versatile of the group, considering the material does not react well with acidic foods and vinegar commonly used in many recipes. The most common practical use for a bare copper pan would be for whipping egg whites since the properties in the pan can ease up the whipping process. Tin is naturally nonstick and is similar in some ways to bare cast iron. It is, in itself, a good conductor of heat, and users of tin-lined copper cookware find they often need to remember to turn their burners down because of how quickly the pan heats up. Tin-lined copper cookware is high-maintenance, requiring plenty of attention to keep it at its best performance and to allow it to last as long as intended. The tin may even need to be replaced eventually, a feat only a few craftsmen in the United States are registered to take on. Stainless is the middle of the road choice for many home cooks who are looking to invest in copper cookware. It ages well with minimal maintenance, sears meat well since it can handle higher temperatures and is easy to keep clean. It’s also relatively affordable, making it a smart choice for people on a budget. While copper cookware is often a valued piece of cookery capable of being handed down through several generations of home cooks, it doesn’t come without a price. 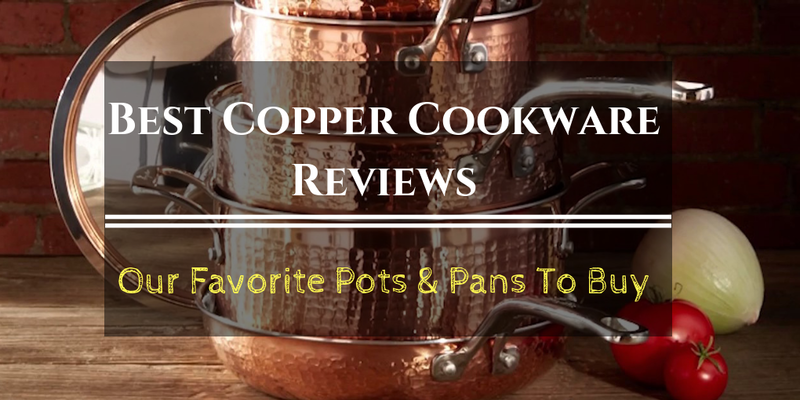 Most high-quality copper cookware sets are incredibly expensive and out of reach for the average home cook. 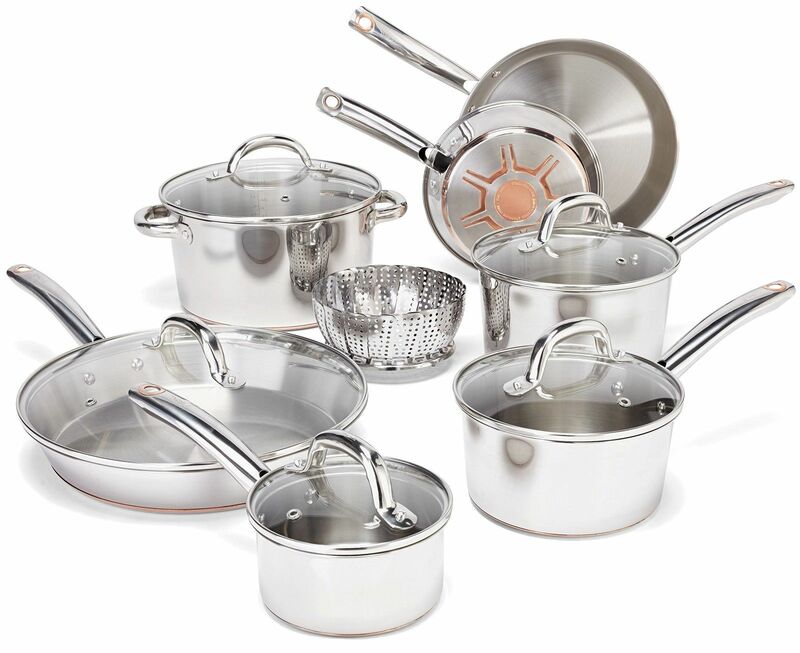 In addition, the cookware itself requires special attention in terms of keeping it clean and well maintained. With these investments of time and money, copper cookware is a long-lasting treasure for anyone who enjoys the art of cooking. In addition to pure copper cookware, technology has developed to create cookware with copper cores. Clad bonded copper core cookware is just as they sound – they have copper cores that are melded between two metallic layers. Tri-ply copper core cookware have a copper exterior, an aluminum core and a stainless-steel interior, utilizing heat conductivity of each of the elements together. 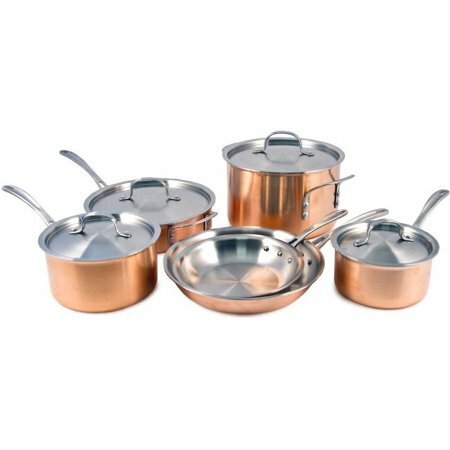 Anyone looking to enjoy some of the benefits of using copper cookware without breaking the bank should consider this impressive 12-piece set. The stainless-steel construction features a multi-layer base with a copper bottom to produce more even heat distribution than its plain stainless-steel counterpart. The cookware is dishwasher safe and oven safe up to 500 degrees which is a plus for searing meats and finishing them in the oven. They aren’t tedious to clean. You can even just clean them by hand. It feels and looks well-made. No parts look cheap. Some people experienced discoloration in their pans. Others suggested using a vinegar cleaning solution to get rid of rainbow discolorations. This set puts all the good metal things together to offer the best overall cooking experience. It features 5-ply bonded layers of stainless steel, aluminum and copper. Hand washing is recommended but you shouldn’t have trouble washing it in the dishwasher as well. If you are looking for a complete set of cooking tools that you will be proud to display in your kitchen, this should be an ideal choice for you. It does heat up the surface of the pan evenly. No more burnt parts on your food! You will like how polished this looks. The flared edges make the content of the pots and pans easier to pour out. Not only is it oven and broiler-safe. It is also dishwasher and induction cooktop-safe. Boasting of superior conductivity and precise cooking control, the Calphalon set features a brushed copper exterior and durable flared rims to help ease pouring. The set includes a sauté pan, two omelet pans and three saucepans, all of which are safe up to 450 degrees in the oven. This is a good mid-range cookware set that is suitable for serious home cooks or for those who like cooking for a large group of people. It is compatible with most cooktops such as Glass, Gas and Electric. No worries about the base being unstable on slippery cooktops like glass. The handles stay cool, making this easy to handle while you cook. It does a great job in resisting scratches and corrosion. Just make sure you use the recommended utensils for cooking. It’s so simple to clean. Even with just a sponge and cold water, the spots will wash off with minimal effort. This isn’t compatible with induction cooktops. When it comes to heirloom copper cookware sets, you won’t be disappointed with this set from Matfer. The beauty of these pots truly allows them to stand out in the kitchen. Although there are fewer pieces in this set than others, they will still be in heavy rotation in your kitchen, with their reliability and multiple functions. If budget is not an issue and you are looking for quality cookware sets to add to your collection, get this. Outstanding heavy conduction. You truly get a superior heating surface. They aren’t difficult to clean at all. You don’t need a high temperature to cook with these pots, you can save a lot of money on gas. There are only a few pots and pans in this set so if you need more pieces to cook for a larger group of people, you might be disappointed. The price is more on the higher-end of the market. Anyone who has spent time in the kitchen whipping up dishes will attest to the fact that it’s not an easy task with the absence of reliable cookware. This is why home cooks should go the extra mile in finding the cookware that will simplify their cooking work. All these cookware suggestions are good but let me help you out further in deciding which one to get. Very few cookware sets in the same low price range as the T-Fal C836SC Ultimate Stainless-Steel Copper Bottom Cookware Set can match its quality. If you are on a tight budget but don’t really want to compromise on the features of the cookware set you are getting, this is a good choice. If you are looking for more pieces to add to your cooking essentials, the Calphalon Tri-Ply Copper 10 Piece Set should come complete with all the things you need. It is a bit more expensive than the previous one but the tri-ply construction gives this more durability. If you want to enjoy copper cookware benefits, consider getting the T-fal C836SC Ultimate Stainless Steel Copper Bottom Cookware Set -- the best copper cookware that produces even distribution of heat. 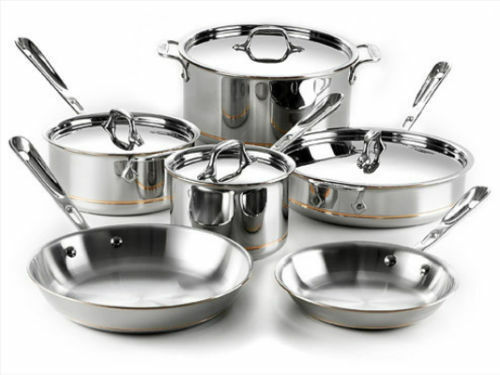 The All-Clad 600822 SS Copper Core 5-Ply Bonded Dishwasher Safe Cookware Set is more on the higher end of the market, but you should expect to use this for a long time, given its sturdy and durable construction. The lifetime warranty this comes with also brings a lot of peace of mind. You can even give this as a housewarming gift. Got more money to spare? 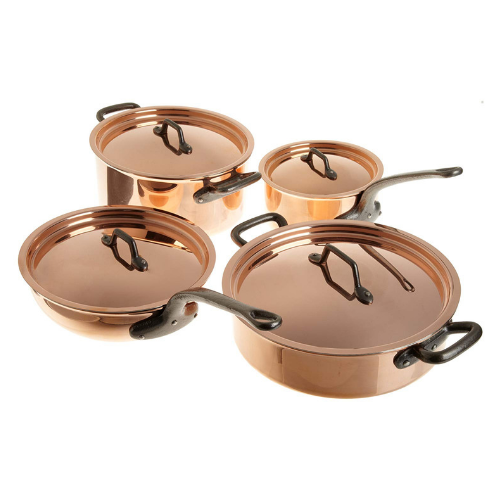 Get the Matfer 915901 8 Piece Bourgeat Copper Cookware Set. You will surely treasure this because it is really meant to become heirloom pieces. You can pass them on to your children when they grow up. Looking for more cooking tools to buy? Go ahead and visit our homepage to find out what else you can buy. Find out what your budget can get you.